When you have the reputation of being a five time wakeboard, and four time wakesurf boat of the year voted by Riders Choice, the efforts that go into holding that title certainly haven’t gone unnoticed. 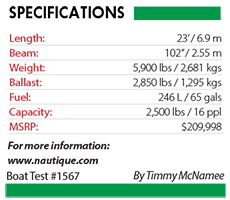 For 2019, Nautique released stunning new features to their flagship model to deliver you an ultimately equipped tow boat. Nautique went beyond any other manufacturer in the industry, and packaged all of the stunning G series premium features as standard for 2019. Rest assured, there’s nothing missing when it comes to the G23. If you’re a video footage junky like me, the G series comes standard with the capability to pair your GoPro camera to Nautique’s 12” touch Link Panoray Display, giving you full control of your GoPro direct from the helm. If that’s not handy enough, you can set your GoPro in unison with the throttle, so when the rider falls your GoPro stops recording. In unison with the re-designed G series frameless windshield, the all-new Flight Control Tower puts the cherry on the cake for this remarkably packaged boat. This actuated system has the ability to fold up and down at the touch of a button. 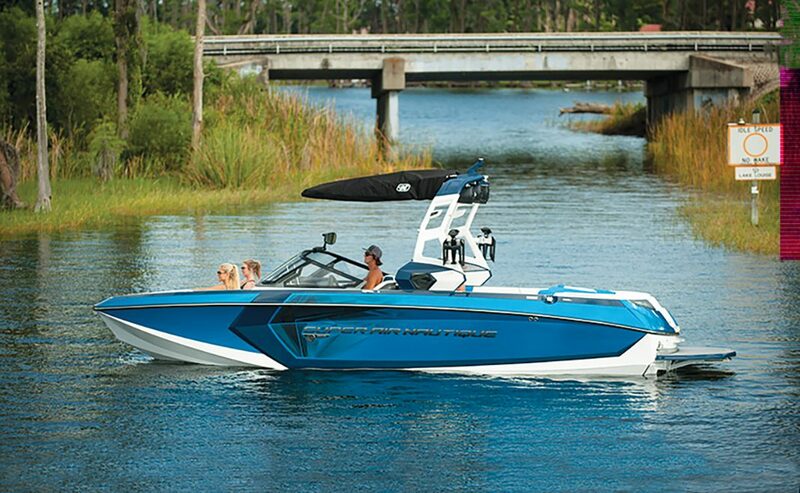 Nautique’s exclusive surf system (NSS) coupled with NCRS result in a steep, yet shorter wave, with ability to mellow or lengthen to a limited preference, as well as switch side-to-side effortlessly. Beneath the platform the Nautique Surf Pipe conveniently expels exhaust under and out the back of the wave so you can enjoy a focused surf, and a quiet over-all ride. Add the optional Nautique Integrated Steering Assist, and feel confident maneuvering your G23 into tight spots, or boat slips. If you’re committed to buying a tow boat with an infinite amount of standard features, The all-new Nautique G23 provides an enter-taining experience to check out!